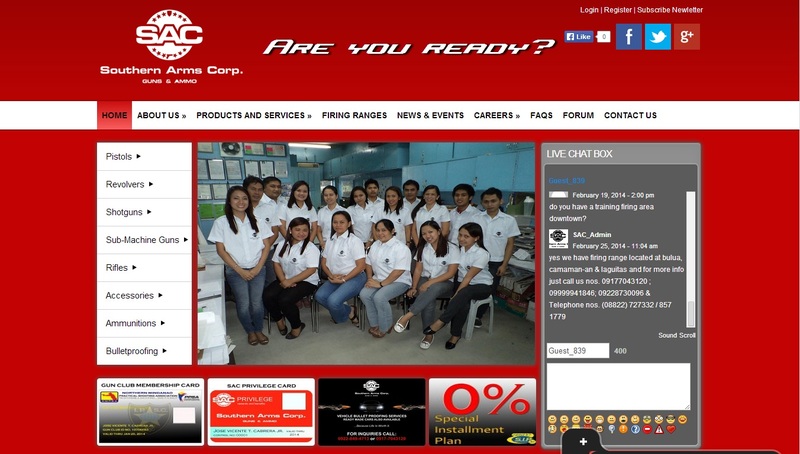 Southern Arms Corp. - Syntactics Inc.
Home > Southern Arms Corp.
Southern Arms Corporation (SAC), a corporation coined in Cagayan de Oro City is one of the fastest rising gun stores in the Philippines. It is duly authorized by the Philippine National Police to operate gun stores and engage in the importation of firearms and ammunitions. From its modest beginnings in 1995, Mr. and Mrs. Jose Vicente I. Cabrera Sr., the owners, were indomitable to provide quality products and services to their clients at reasonable prices which are maintained until now. Today, it has protracted its reach throughout the archipelago with eleven branches and counting.